Giddy and Twinkle are doing their part in helping homeless dogs in New Hampshire and surrounding area rescues and shelters find new home with their wit and humor, thanks to Peace for Paws Dog Rescue. 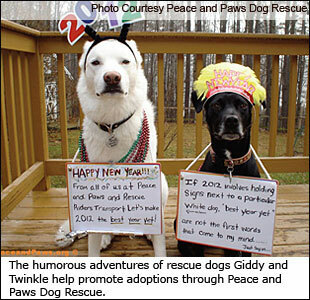 Peace and Paws Dog Rescue, Hillsboro, NH, knows that humor is not something usually associated with dog rescue. There are many sad aspects to rescuing homeless dogs. The dogs may be sick, have unfortunate pasts that need to be overcome, and many need a lot of training. Rescuers deal with things like this all the time and it’s the norm. However, Peace and Paws has taken a different approach. Bo and Melissa Hannon, founders of the rescue group, say, “People like to laugh more than they like to cry, and we want to educate people but also catch people’s attention.” Thanks to their two dogs, Giddy and Twinkle, they’re doing just that. Giddy, a white Lab/Retriever mix, is the more serious of the two canines, and is usually photographed with a sign around his neck giving some type of tip on how to care for your dog. Twinkle, a “party in a black fur coat,” is the quintessential party animal. Her signs are funny and fun, and a bit sarcastic. While they use humor to get the word out about the dogs in neighboring states’ rescue groups and shelters, they’re serious about rescue. Not only do they help dogs find homes, their efforts have sparked a new website – Freekibble.com, a site that helps provide nutritious food to shelter animals. They Honked and It Worked! So cute. Keep up the good work.